Yesterday by FedEx - a reMarcable treat arrived. 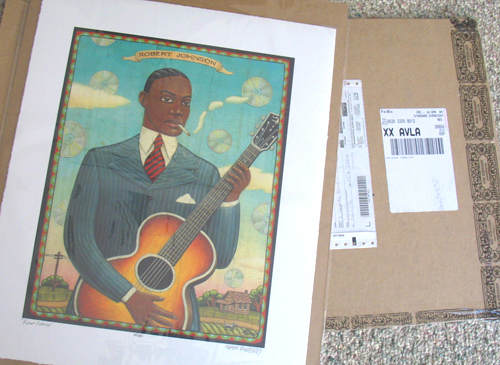 A signed and numbered print by Marc Burckhardt, of Robert Johnson - all for me! It's impossible to explain how fine this print is. The brilliant colors, the luxurious paper, the exceptional quality of the print itself are all simply breath-taking. This is one truly exquisite work. The man is a master, done deal, game over. Luckily for everyone, Marc has the same quality of prints for sale at his illogator shop, which just opened for business this week. Check it out! Marc has his own tape! I mean, how many people have their own tape? Gimmi a break! Off to the framer! I have the best in town! Marc has his own staples too! I don't know if you can tell, Zimm, but I'm blushing. Many thanks for all you've done for the folks here at Drawger as well as Illoz and Illogator. Tomorrow, the world! Gorgeous! Zimm, you are one lucky dude. I too can't get over the tape. 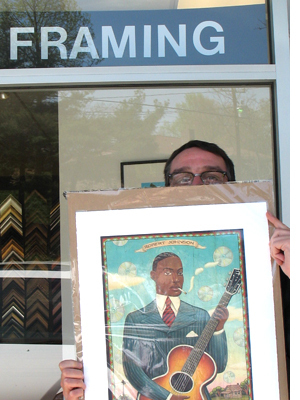 Oh yeah, and Robert Johnson ain't too shabby either! Marc, your shop looks great. I'll take one of everything, please! Marc, that's always been one of my favourite portraits - that and the young Johnny Cash you did for Rolling Stone. Great stuff, pal. Lucky duck. 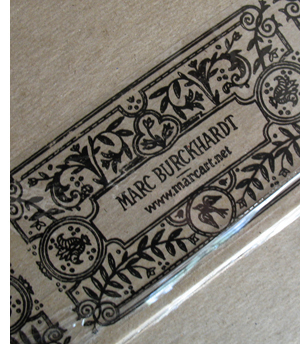 I don't see that print on Marc's "prints" page though.